Being able to fix your bike or a friend's bike in a well-stocked garage is pretty cool. Breathing life into a broken steed in the middle of nowhere is a next-level superhero feat. Every superhero needs a few tricks up their sleeve. 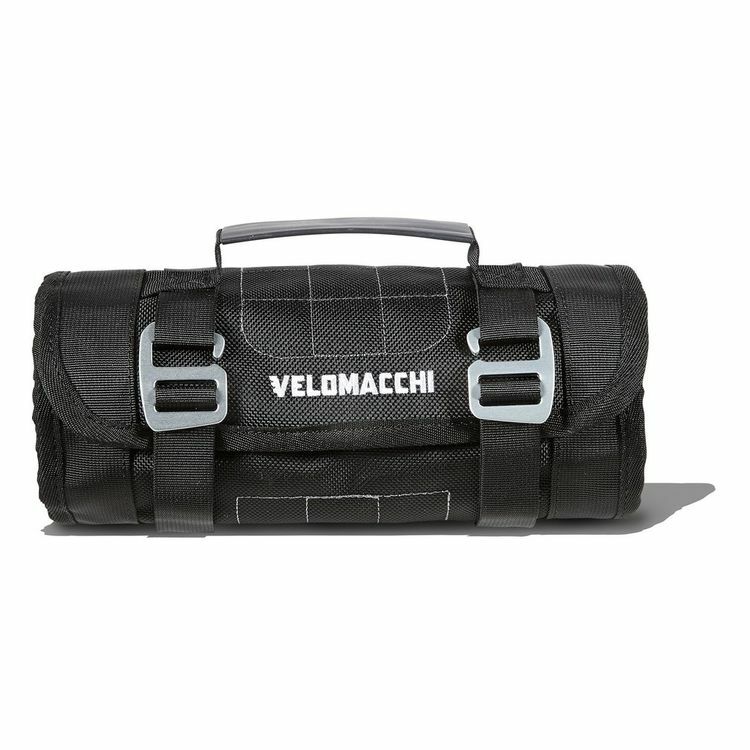 The ace up your sleeve should be the Velomacchi Speedway Tool Roll. It abounds with storage capacity and the main flap doubles as a work tray; it even has a built-in magnet for preventing nuts and bolts from wandering off. Expensive but well made with lots of style and pockets. Feels very strong. Got it for my new Gold Wing so I bought brand new tools to fit in it. Paid too much for them as well. But it now is a very classy tool roll. It's absurd to get excited about something like a tool roll but I absolutely love this thing. I was actually planning on sewing my own tool roll from leather and waxed canvas so I could make it exactly how I wanted it. But then I saw this one in person at a bike show and it completely changed my mind. It's large enough to hold wrenches, screwdrivers, CO2 cartridges, and the burly zippered pocket is large enough for a full set of metric sockets. Even loaded with tools, it still cinches down into a small size that I can easily attach to the bike or throw in a backpack. This is everything I need in a single design. I especially love the flap with a magnet to lay out any nuts and bolts you remove and keep them from rolling away when you're doing some unplanned maintenance on the side of a road. Is this product more expensive than some of the other tool rolls out there? Yes. But is it better? Hell yes!!! This is the one the go-to bag I can grab for any bike and any adventure on any continent. I probably sound like a shill for the company. I wish I were so I could get deals on more of their stuff. Good company, located in Oregon, USA.